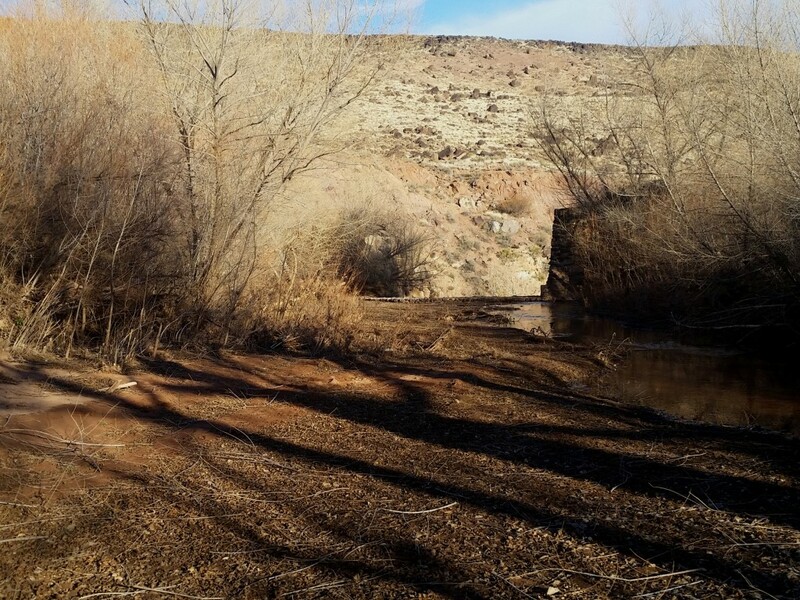 ST. GEORGE – The Washington County Public Works Department awarded a bid Monday for work on the historic Shem Dam on the Santa Clara River near Gunlock. 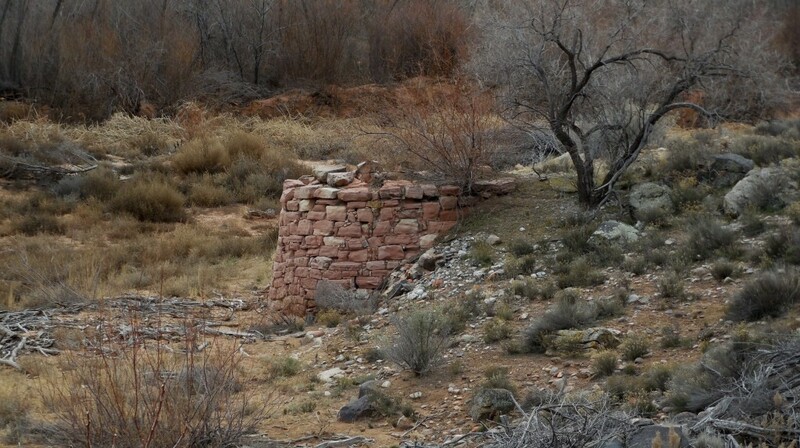 The dam is located on Gunlock Road, about a mile north of the junction with Old Highway 91, on the Shivwits Reservation for the Paiute Indian Tribe of Utah, Shivwits Band of Paiutes. The bid was awarded to Progressive Contracting Inc. of St. George for nearly $1.6 million. The structure was damaged in recent floods, and is in urgent need of repair, Washington County Public Works Director Ron Whitehead said. “Without some type of major repair, it’s in danger of going down if it had another big (flood) event go through it,” Whitehead said. The dam has filled with sediment over the years, and water has significantly damaged one of the concrete and boulder abutments, he said. 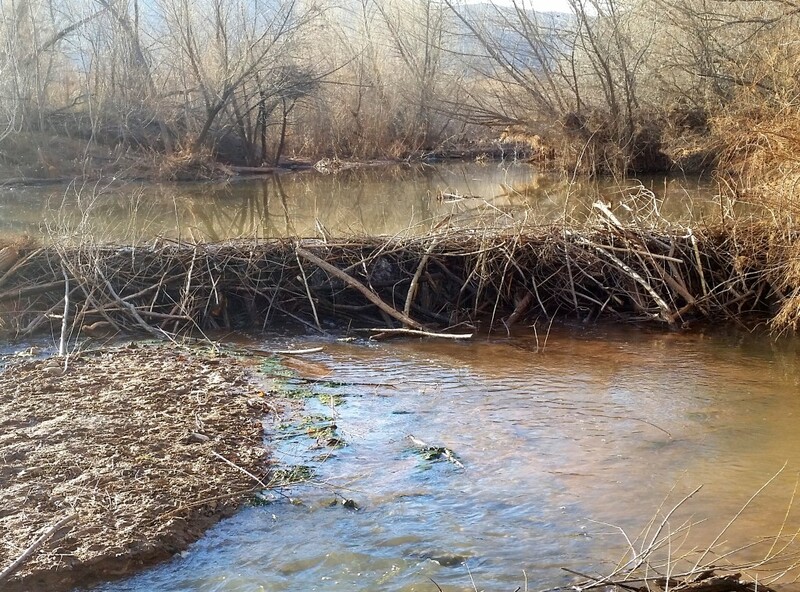 If the dam did fail, the sediment and boulders could damage two downstream bridges: the first just a few hundred yards downstream from the dam; and another on Old Highway 91. The Shem Dam was originally constructed by the Civilian Conservation Corp in 1934, according to the Washington County Historical Society. It functioned as a diversion for irrigation water which then flowed around the Ivins-Santa Clara bench, Whitehead said. 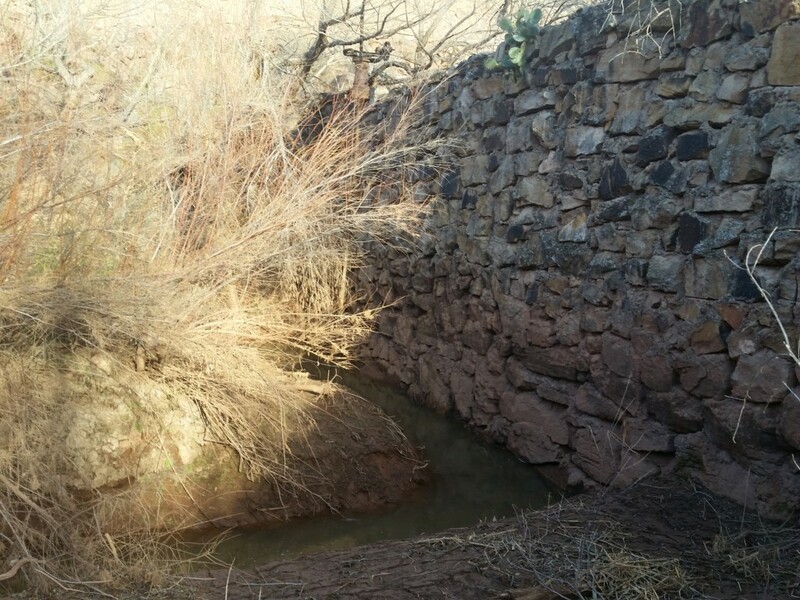 The dam has filled with sediment over the years, and while it is no longer used for irrigation, it has historic value the county wants to preserve, Whitehead said. Plans are to lower the center of the dam, so water can flow through, and reinforce and repair the rest of the structure while maintaining the historical features of the dam. Both abutments will be reinforced, sediment will be removed above and below the structure, the existing spillway will be demolished, and a stepped rock chute will be built where the current spillway is located. After the project is complete, the area will be revegetated. Construction is expected to begin Jan. 20 and be completed in an estimated 109 days, Whitehead said. He does not foresee any road closures or major traffic disruptions. The project is funded by the U.S. Department of Agriculture’s Natural Resources Conservation Service, which provides money for restoration and prevention of flood damage, Whitehead said. Because the dam is located on the Shivwits Reservation for the Paiute Indian Tribe of Utah, the tribe was consulted during the planning of the project, he said. “The tribal council is involved with us and they’ll have monitors out everyday we’re working on it to oversee the project. 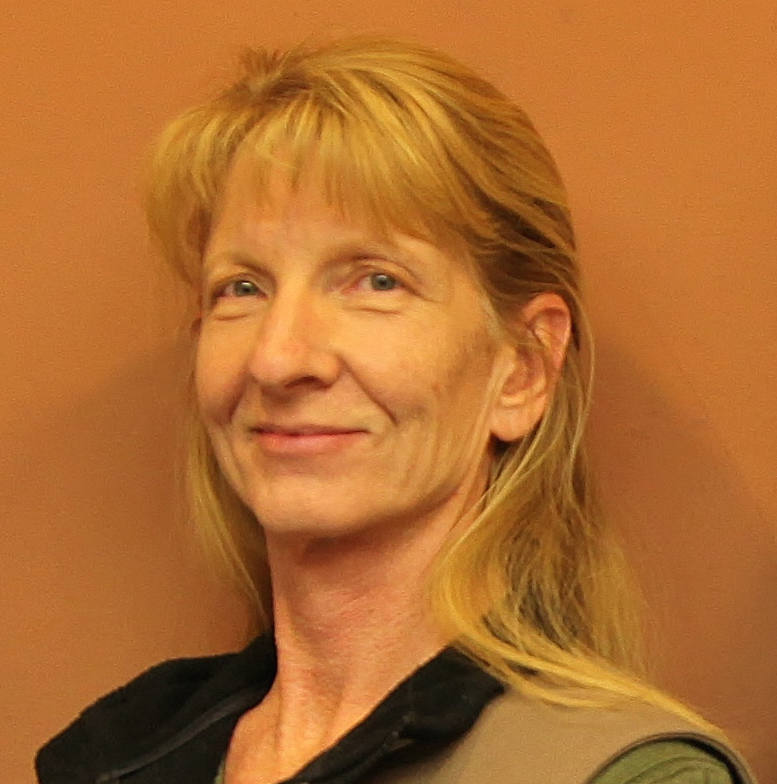 There are cultural resources nearby and they want to make sure none of that is disturbed,” Whitehead said. 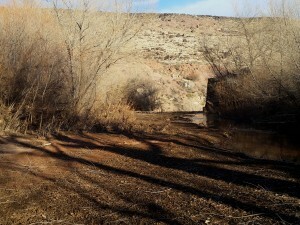 Glenn Rogers, a member of the Shivwits Band of Paiutes Council, has been involved in planning the dam’s rehabilitation. The dam is not structurally sound, he said, and is not internally reinforced like newer dams. “It’s a historical site, we want to preserve it,” Rogers said. Rogers is also interested in conserving native plants that were used by the Shivwits for survival before the modern era. Among the plants used historically are water sage, cottonwood, watercress, peppermint, squaw bush and prickly pear cactus. 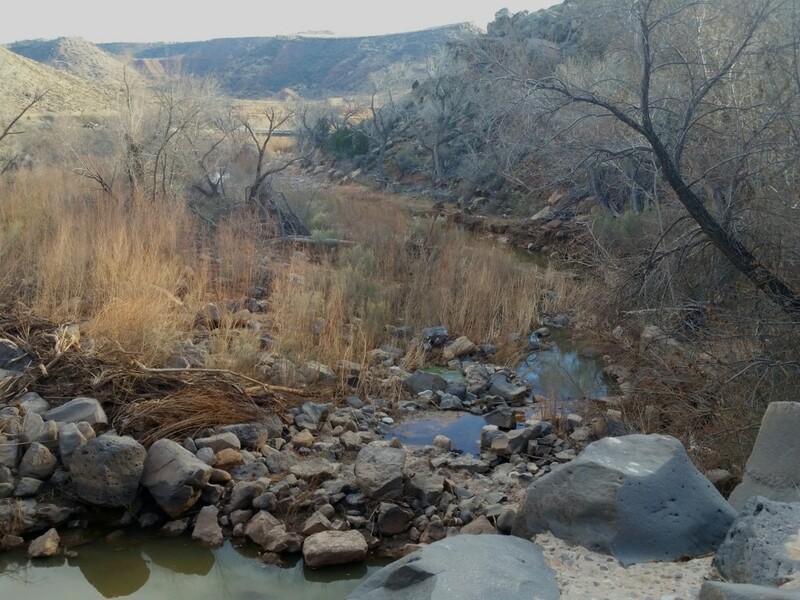 While the dam can be seen from Gunlock Road, it is on tribal land, and permission is required to enter the property. According to the Washington County Historical Society website, the original Shem Dam was constructed in 1909 as a brush and concrete structure about 600 feet upstream from the current location. The brush and concrete dam washed out in the spring of 1932 during a flood. In 1933 and 1934, the current concrete and basalt boulder dam was built by Company 961 of the Zion Civilian Conservation Corps camp. 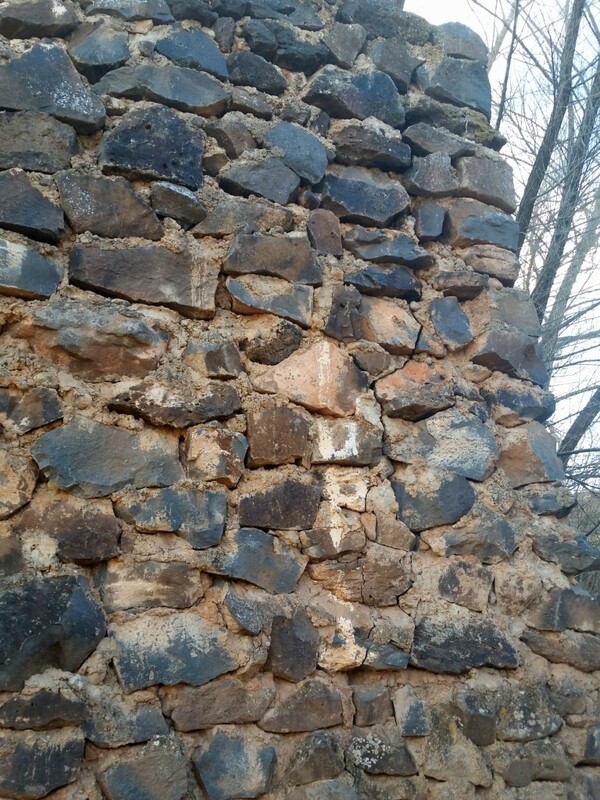 The original structure was 42 feet high and more than 300 feet long. The Civilian Conservation Corps was created during the Great Depression, and was developed to take young, unemployed men and put them to work on public lands while providing them with skills needed to obtain future employment, according to the National Park Service website. A 1955 flood destroyed part of the dam, and it was repaired in 1958. In 2011, the dam was again heavily damaged by a flood, raising concerns about its structural integrity and ability to withstand future flood events. A few hundred feet upstream from the Shem Dam is an old copper smelter. According to the Washington County Historical Society, the smelter was built sometime after the Utah Eastern Copper Company bought the Apex Mine, located in the Beaver Dam Mountains, in 1898. The smelter operated for about 10 years and was used to process ore from the Apex Mine and the Black Warrior Mine. The smelter is on tribal land, but can be seen from the Gunlock Road. The historic structure is not expected to be impacted by the dam rehabilitation, Rogers said. I dunno, if the Shem Dam serves no purpose anymore, why spend 1.6 million? It’s not like people drive there to see it or picnic there. It’s just an old Dam that has outlived itself. I’d rather see the money spent somewhere else where people actually go to such as Gunlock Reservoir or Sand Hollow. That’s a lot of money to spend on a frivolous project. Just say no to federal money! Tea Party storm troopers- arise and gird your loins. This federal meddling cannot stand!! Where is the moral outrage? BIG GUY, I expect you to chain your self to the bulldozers and prevent Hussain Obama from his meddling in local affairs. We don’t need your filthy money Washington DC. Seems like a waste of money to preserve something that serves no purpose and thatmmost people could care less about. Oh well, it’s just government money being wasted. I’m surprised there isn’t a church next to it. Nicely written article and the photos really added to the tale. Although the natives will be restless, regardless of whether the dam is rehabilitated or not, the story served to point to the heritage of the area, not to the pandering of the whinos. The reason the dam is being rehabilitated is because if we left it as is, it would likely fail during the next flood season. When that happens, the river downstream and all the communities would be seriously impacted, which would cost even more money to recover from. Legally, the government has to comply with historic preservation and environmental laws, so this project is a compromise between removing the entire dam (more expensive) or leaving it in place to come crashing down at the next flood and carry all the sediment and debris downstream. The government spent a long time developing a strategy to preserve some of the history, and to protect the millions of dollars of property downstream.